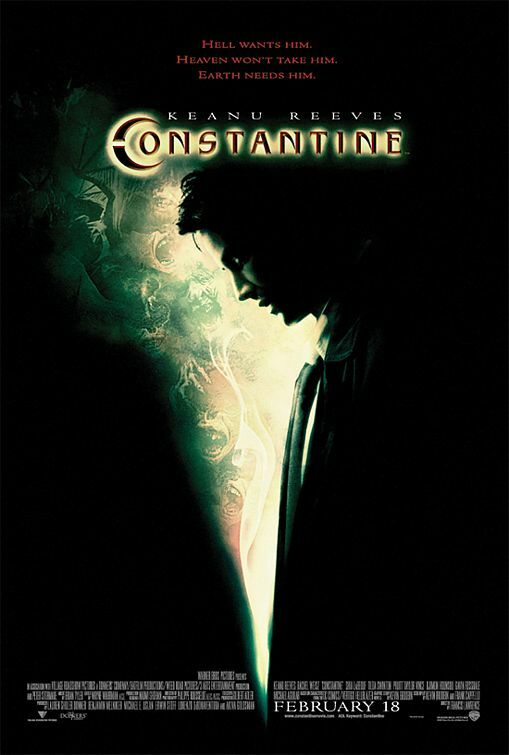 “Constantine” is one of those strange films that doesn’t quite work. There are some great moments in it, especially when it felt like the amazing character Constantine was there (Keanu Reeves managed to pull it off when he was given good dialogue), but the weird pacing, clash of tones and overall stilted dialogue keep this film from ever reaching good. Constantine is a fascinating character who is driven by outsmarting the greater powers than himself, he’s a deal maker and cynic and I wish we could have seen more of that, as well as the personal nature of most of the stories in the “Hellblazer” series where his story is told. The film was directed by Francis Lawrence, written by Kevin Brodin and Frank Cappello and produced by Akiva Goldsman, Lorenzo di Bonaventura, Michael Uslan, Benjamin Melniker and Lauren Shuler Donner. The story involves Constantine (Keanu Reeves) facing his mortality as he learns he has terminal cancer as Detective Angela is pulled into his world after the mysterious suicide of her sister (Rachel Weisz plays both characters). As Angela discovers the magic that exists in her family forces plot against the world as Constantine and his allies must work to save it and prevent the end. The Pros: The World – The world is one of the best parts of this film! There are half-demons and half-angels, and it takes place on the world stage in a world full of broken people. There are not heroes in this and that is part of what it makes it so fun. Cinematography – The CGI is a little dated but the style of it is still amazing. I loved how Hell was done and how they presented seeing things that are hidden from us in our world. Philippe Rousselot did a great job. Introduction to Constantine – We are introduced to Constantine as he kicks a warrior demon out of a girl. His interactions with the people and the demon is straight up Constantine. He’s standoffish, business all the way through and after takes out. Even his friends give him space. Hell – Hell is a twisted version of our world above and further below you have people consuming and being consumed. It was a very creative take on Hell and added terror to the demons we met. Luficer – This Luficer is the threatening salesman and it works. He has power to how he speaks, with an heir of threatening kindness. I liked the white suit and the detail of him leaving behind black wherever he walked was great at giving him an otherworldly feel. He ends up punishing his son for breaking out and dealing with the half-angel Gabriel to try and take over and nearly takes Constantine until God protects him when he offers his life for Angela’s sister. Chas Kramer – Shia LeBeouf was so much more likeable before “Transformers” and his later stuff. In this he’s Constantine’s driver and shows that he’s been studying up on how to fight demons too in the final fight, even though he does die he gets a lot of humanity and shows he isn’t just a fan, he wants to be respected. Papa Midnite – This character is cold and cruel and after is chill and acts like an old friend again with Constantine. I like both versions of the character and just wish he’d been written more consistently. Djimon Hounsou does a fantastic job. Constantine – Keanu can act when given the chance and he shows it here. We see him mad, sad, empathetic and all the emotions of a man dealing with death. His character also gets an arc too as his friends all die to Gabriel and Mammon but God protects him in the end when he finds belief and stops smoking since he got 2 chances as he kills himself twice over the course of the film (first to end the torture his parents were putting him through, second for the meeting with Luficer). Okay: Constantine’s Arc – the arc was too easy, he is a cynical guy who knows that there are tons of higher beings out there but knows they can’t be counted on (even God drops the ball on letting his friends die and all the people who died from the fallout of Mammon and Gabriel getting their plans together) so him becoming a sudden believer made sense in the simplest of arcs but didn’t feel quite true to the character…so putting it at okay. The Cons: Angela Dodson – Rachel Weisz is usually always the damsel and she is here too. She learns how to have psychic powers and is used by the villains almost immediately. It’s annoying and I hated that her character only seemed to exist in this role. The Dialogue – The dialogue is stilted and sometimes characters will make comments that are meant to be jokes but it just ruins the tone of the scene and makes the pacing feel choppy. Tone – The tone is thankfully largely dark but the moments of attempted humor don’t always work when they try go light hearted, I almost think this was meant to be a PG-13 movie but because they went for the R it just made the tone jarring. Pacing – Thanks to tone and dialogue the pacing doesn’t flow all the time. The pacing of the opening and middle are fine but right around the end and leading up to the climax there are scenes that linger and it ruins the pacing. This is a film that is worth seeing once or renting and that is it. The great moments where Constantine is the cynical anti-hero of the comics make this film a lot of fun, and Keanu has more range than he is given credit…I think he suffers from having films with bad scripts or off tones, as this film does, but he is still a positive of this film. There were moments he felt like the Constantine in the comics, even though Constantine finding God and quitting smoking felt out of character, in all the “Hellblazer” comics I’ve read, nothing close to that happens. He makes deals and cons higher powers, he doesn’t give them worship. Still, I get why they did the arc, Constantine’s growth when it happens is hard write, so these writers took the easy way to write growth rather than writing something more complex, but given that they wrote the dialogue, the story is going to be brought down regardless. Rent it if you like Constantine, DC and Vertigo comics and films or like Keanu Reeves, but don’t go in expecting a good film.